Our awesome birthday parties are 90 minutes long and hosted in our private and colorful party room, accessorized with a karaoke machine for kids to sing along with their favorite songs. All parties are led by our “Pink Starlets” so parents can focus on enjoying their children having fun and taking pictures if you choose. Please call for details and reservations. 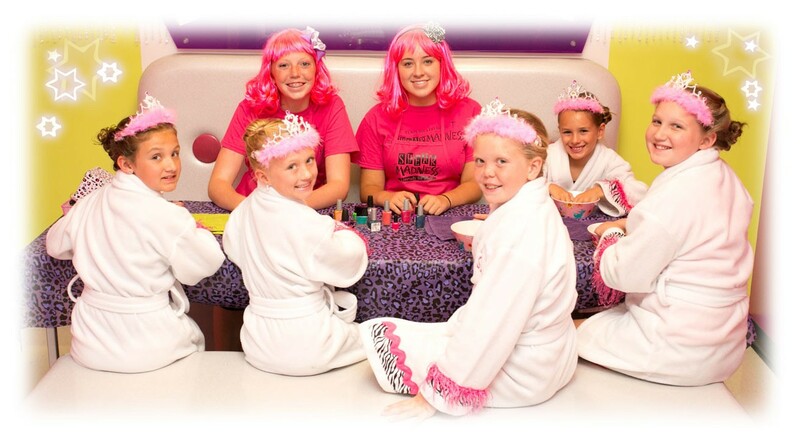 Girl Diva Birthday Parties – Your special little Diva and five of her closest friends wear our LA-DE-DA Spa robes while being pampered with glittery make-up, mini manicures and glitter tattoos. After opening gifts, we will take an awesome keepsake photo and everyone will autograph it for the birthday girl! Also, each girl gets to make her own lip gloss! Parties are 120 minutes and $150.00 for up to six Divas. $25.00 per additional girl. A $50.00 deposit is required to reserve your desired time slot. The deposit is deducted from your balance due on the party day. Available times for parties: Monday – Friday, 5:30-7:30. Saturdays, 11-1, 2-4, 5-7. After hours parties are also available. (956) 627-6374.